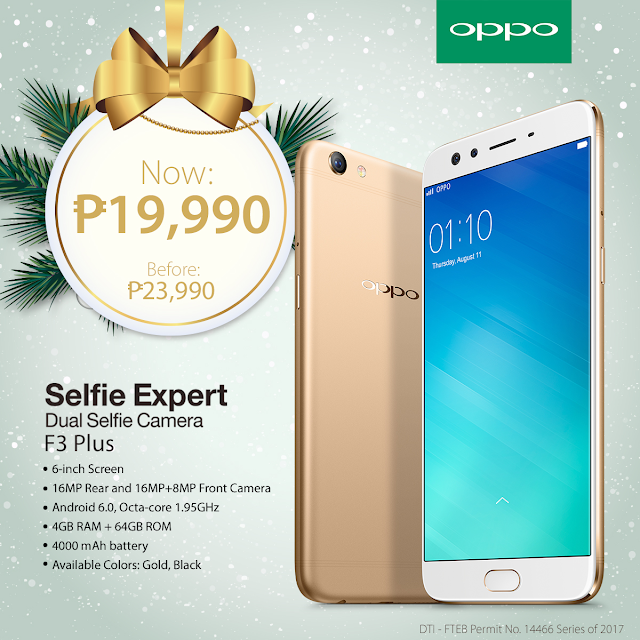 The country's premier Selfie Expert OPPO has a lot of exciting offers in store for every one this Christmas Season as it officially announced its holiday promo for you or if you are feeling generous this Christmas- of course you are! 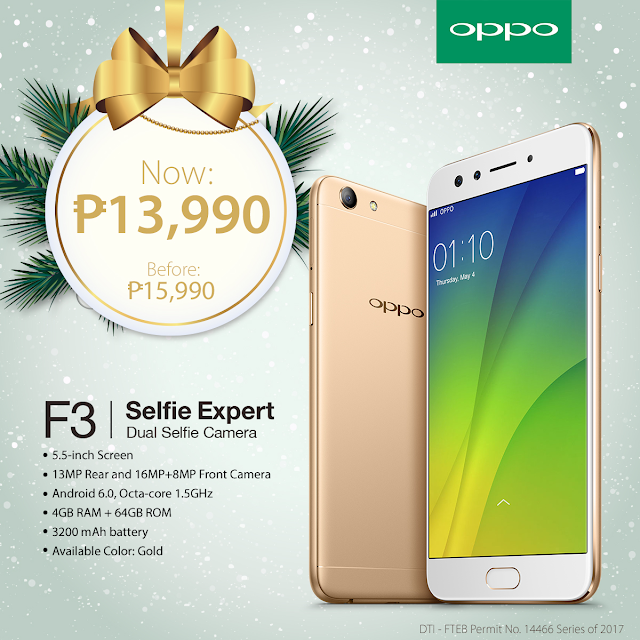 Get an OPPO F3 Plus for only P19,990! This beauty has a 6-inch screen that's super perfect for taking groupies this holiday season. What's more, it has a dual selfie camera for that optimum capture, and boasts of a 16MP rear camera and takes clear and crisp photos. How cool is that? Another great feature of OPPO F3 Plus is its built-in 64GB storage so you won't worry about taking a lot of selfies and groupies this Christmas season.Then there's the 4,000mAH battery with VOOC rapid charging technology. Really, this is one of the best mobile phones. Of course, there's the equally spiffy OPPO F3 with a special price of P13,990! Like its bigger sibling, the F3 has an octa-core processor and 64GB storage. Really, just imagine how many selfies, groupies, and even videos you can collect? It also has a two simcard capacity and a dedicated microSD slot. But if you're looking for a starter phone, there's OPPO A57 for only P10,990! OPPO A57 is the perfect smartphone if you are on a budget or you want to give your child his/her first phone. But don't fret because even if it costs less than the F3, A57 has a 13MP front camera, 16MP rear camera with Beautify features. It also has a 32GB storage which makes it a Selfie Expert phone. And there's more good news. 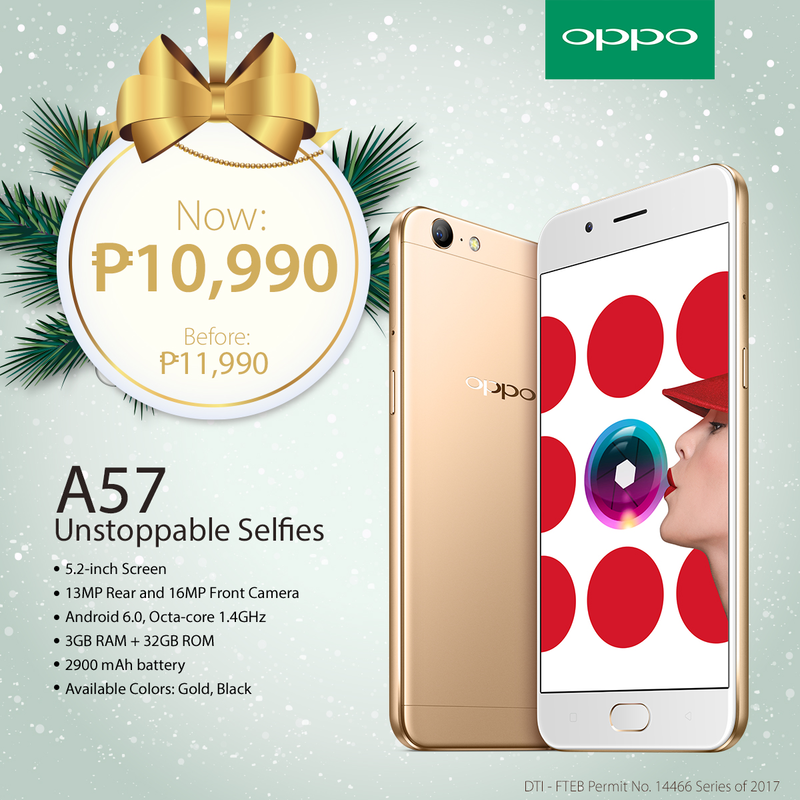 After purchasing your OPPO F3 Plus, F3, or A57, you'll be getting more treats such as bluetooth speakers, selfie sticks, and more. Isn't that a Merry Christmas indeed? OPPO's Goes GCash Mo Na Yan! Sykes 20 Years "Limelight" Celebration!